Choose your favorite juices to make these granitas. You might prefer one variety, or several. I find that thick juices like pear, peach and apricot are especially good. Serve the ices straight after crushing- they melt fast. 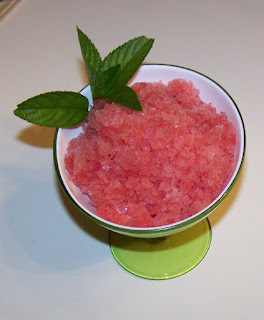 How to make frozen fruit juice granita: Add sugar so that the juice is just a little sweeter than you like to drink it ( freezing reduces sweetness). Fill ice cube trays with fruit juice. Freeze. When ready to serve, turn out into 4 small bowls and crush with a fork- you are aiming for and icy texture, not smooth like an ice cream. Serve in small glasses with spoons. Alternatively, fill each glass with frozen juice cubes and top with icy buttermilk.